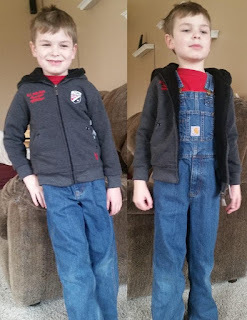 Jack got another Kidbox styled for spring! Let me tell you about what he received. First was this cute Losan graphic tee (Kidbox price - $31) and French Toast crab print shorts (Kidbox price - $17). I love em both! He hasn't worn them yet, and please don't base his approval on his expression. Lately he insists on not smiling for pictures. Oh, where does he get these ideas?? The shorts are more tailored than anything else he has, but the crab print still makes them fun. He just last week started wearing short-sleeved shirts (he says you have to wear long sleeves with long pants, and short sleeves only with shorts). I'm hoping we'll get more wear out of this outfit as the weather warms up. The other summer outfit I liked best was this Nanette dino print tee (Kidbox price - $11) and Eland chino shorts (Kidbox price - $24). He said the dino shirt was his favorite thing from the box, but he isn't quite up to speed for wearing short sleeves yet. While I think both of these outfits look nice and are hopefully still comfy enough for casual wear, he's still waiting for true summer to settle in. Fingers crossed it warms up soon!! Honestly, he's a reasonably happy kid! Here he is in the Eland raglan long sleeve tee (Kidbox price - $25) and Reebok short (Kidbox price - $21). The color of this shirt is deep and flattering on Jack. His dad also has one the same color, so I'm sure I'll get 'twinsie' pictures of them in them sometime. The shorts are super-soft and comfortable. He wore them for 'yellow' day at school because the stripe on the side is bright yellow. The last item in Jack's Kidbox for spring was this U.S. Polo Assn zip front fleece hoodie (Kidbox price $31). He tried it on over his favorite Super Mario outfit. The jacket definitely came in handy, as his winter coat has a broken zipper, and the cold days weren't yet gone when our spring box arrived. He's worn it quite a few times as a coat for school. We kept everything for $98 (vs their stated retail price of $217.50 :O ). If you'd like to check out your own Kidbox, user our link to get $25 toward your first box! Cute items! The pricing isn't bad either. I didn't know they have subscription boxes for kids but they have them for everything these days lol. Nice items he got. Cute looks indeed!